Do you want to upgrade your style this summer? The perfect summer wardrobe also requires the perfect and lightweight shoe. Printed sliders are far more than just a poolside accessory. Actually, it is a form of a sandal and sandals are considered one of the earliest form of footwear. The name of sliders originates from the fact that they are very easy to slide in since they are backless. Besides that, they’re also super comfortable and trendy. Even if they have been around for centuries, they have been a huge trend lately and are essential for every well-appointed wardrobe. At Garment Printing you can even design your very own pair of sliders! Whether they are classic and sporty such as the typical Adidas Adilette or covered in fake fur, sliders can come in a lot of different styles. Thus, it makes them easy to wear to different occasions and to either dress your outfit up or down. There is no denying that customised sliders will make you stand out from the crowd. Why not combine them with your own personalised t-shirt? The open-toed footwear is backless but they can still be easily printed on because the band across the toe offers enough space to customise your product with the design you want. As with all our printed custom products, at Garment Printing we offer the best and most advanced printing techniques such as screen printing , sublimation printing , transfer printing etc. as well as state-of-the-art machinery to offer our customers the highest quality possible. Further, our exceptional service is simple and easy to use and you can send us your artwork file and we’ll print the sliders and then deliver them directly to your door. The standard sole colours are black, white and navy and we also have standard strap colours of black, white and navy also. When it comes to standard soles, there is no minimum order quantity because every pair is custom made to order and you can have a mixture of any colour combinations from the above colour options. We can print in either one of two colours and we also offer a specialised full-colour printing option which includes individual customisation if requested. The bespoke colours can be any colour and we can Pantone colour match to stay inline with your corporate branding. 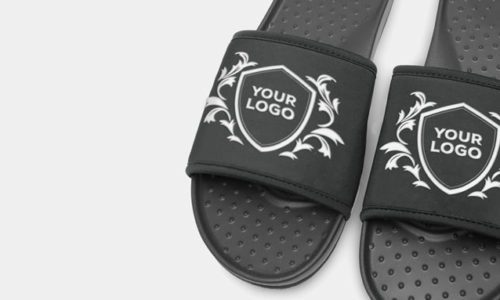 We can also emboss your logo onto the sliders but there is a minimum order quantity of 500 units per design because we custom make the material specifically for each order. The typical approximate pricing is listed below, please also bear in mind that these types of sliders will often sell for around £25+ per pair for standard brands in the 1000’s (like Adidas) and for exclusive brands they can sell for up to £125 per pair (for brands such as Gucci). With our bespoke printed sliders, you’re getting fully customised footwear for the below prices. If you would like wholesale standard sliders, please contact us for more information on pricing. Also, please bear in mind that, unless specified differently, all of the wholesale standard sliders are printed with the Garment Printing logo on the sole. The average price for 20 sliders is £39.99 + VAT. These prices are for high-quality materials and the price can be brought down using different materials but not for orders which are under 1000 units. If you want to be on-trend this summer or if you would like to make a statement, then get a quick quote now, order online and take your summer style to the next level! For wholesale standard sliders, there is no minimum order quantity. Can the straps be printed a different colour to the sole? Can the left be printed differently to the right? If so, how different can it be without affecting the price? Yes, it can on wholesale standard and the unit price will fall either under one colour price option or full-colour depending on the design. All of the sliders are paired and have cardboard inserts under the straps to keep the shape. They are then bagged in pairs in either our cellophane branded bags or in unbranded bags with the size stickers on each bag. Can you print glow in the dark or reflective onto them? Yes, we can and we can also print using metallic. Sample unit price for all orders? We can send samples to check the quality. The price for just one sole is £20 + VAT + delivery and then the sample must be returned to us. Once we receive the sample pack we will then refund the £20. Prototypes can also be made but this is dependent on the design.